The Louisville Fencing Center, in conjunction with Jewish Hospital and Frazier Rehabilitation Center, has established one of the nation’s premier wheelchair fencing programs. Wheelchair fencing is a sport in which men and women who are physically disabled can compete to the highest level of their ability. • Level A: For fencers who are amputees or polio victims. • Level B: For fencers who have spinal injuries where only the legs are affected. • Level C: For fencers who have spinal cord injuries where both arms and legs are affected. Sports for athletes with disabilities grew from the dedicated work of Sir Ludwig Guttmann. Considered the “Father of Paralympics,” his concern for his patients and belief in using physical education to benefit rehabilitation efforts gained substantial popularity. In 1948, the first international competition — the Stoke Mandeville Games for the Paralyzed — was held on the same day as the opening of the 1948 Olympic Games in St. Moritz, Switzerland. Sir Guttmann envisioned a larger international forum to include national and international games for premier disabled athletes in the United States. In 1989, the International Olympic Committee sanctioned the International Paralympic Committee, resulting in competitions to be held in conjunction with the Olympics. In 1995, the United States Fencing Association and Wheelchair Sports, USA, the governing authority for wheelchair sports in the U.S., established the first wheelchair fencing programs in the United States. The sport has grown rapidly over the last several years. How Do Wheelchair Fencers Bout One Another? 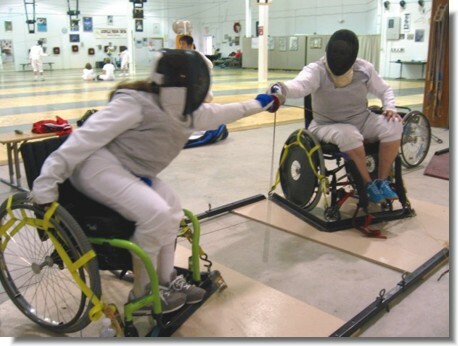 Wheelchair fencers wear the same gear and use the same weapons as able-bodied fencers. 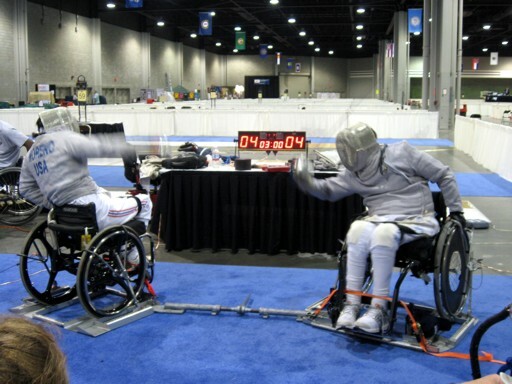 Fencers sit in wheelchairs that are attached to heavy metal frames. While the wheelchairs remain static, wheelchair athletes must manipulate their weapons to gain touches against their opponents. The Louisville Fencing Center has developed a state-of-the-art wheelchair frame and is one of the only fencing facilities in the nation that caters to both disabled and able-bodied fencers. Under the direction of Maestro Stawicki, Louisville Fencing Center is recognized for its outstanding facility and world-class wheelchair athletes.